qualifications are suggested to apply online using the official website of ICG @ www.joinindiancoastguard.gov.in. 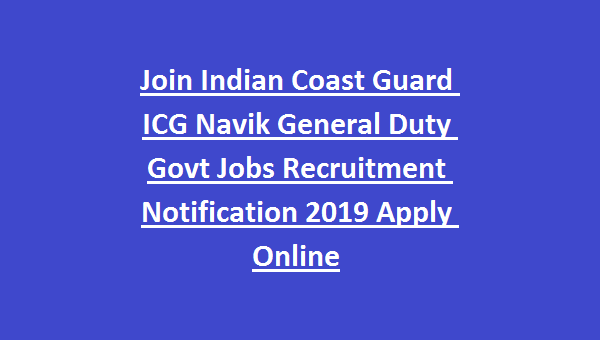 Online registration of applications for the post Navik in Join ICG Recruitment starts from 21/01/2019 and closed on 31/01/2019. This ICG Navik General Duty Recruitment selection will be based on written test (objective type) followed by physical Fitness Test and Medical Examination. Examination date will be conducted in February 2019. See the below given details for Educational Qualifications, Available vacancies, Age limits, Examination Centres & Syllabus and Application process of Join ICG Navik GD Jobs Recruitment examination. Pay Scale for the post of ICG Navik (GD) is Rs.21700/- plus other allowances will be given based on place of posting/ nature of duty. Candidates must have passed 10+2 with 50% aggregate marks from an education board recognized by Central/ State Government. For more details see the official notification. Candidate should have minimum age of 18 years and maximum age of 22 years (born between 01-Aug-1997 to 31-Jul-2001). Upper age relaxation of 05 for SC/ST candidates and 03 years for OBC candidates will be applicable. Selection for this Join ICG Navy (GD) recruitment will be held based on objective type written test followed by Physical Fitness Test and Medical Examination (Preliminary). Written Examination will cover the subjects such as Physics, Basic Chemistry, Maths, knowledge of English up to 12th standard, Current affairs, General Knowledge, Quantitative Aptitude and Reasoning etc. - 1.6 km run in 7 minutes. Examination Centres: Jalandhar, Dehradun, Noida, Jodhpur, Varanasi, Paradip, Guwahati, Haldia, Kolkata, Chennai, Mandapam, Secunderabad, Visakhapatnam, Bhopal, Kochi, New Mangalore, Mumbai, Gandhi Nagar, Port Blair. See the ICG official notification for Examination Centres and Address details. - and closed on 31/01/2019. 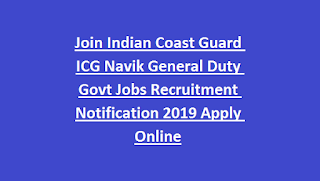 Click hereto apply online for the Join ICG Navik GD Jobs Recruitment 2019. Please share this Join Indian Coast Guard Navik (GD) Recruitment Examination 2019 article to your friends via social web sites (FB, Google Plus and Twitter).